It’s clear that for the majority of Wasilla, Eagle River, and Southern Alaska residents, the most important aspect of flossing is simply that you do it every single day. However, many dental patients find that trying out a few different types of floss helps them to establish the habit and get the flossing comfort they desire. Let’s take a look at some of the most common types of dental floss found in Anchorage area drugstores. Basic floss is either a monofilament floss, which is usually made of some kind of rubber or plastic, or multifilament, which is made of nylon or silk. Nylon floss is less expensive, more common and is sold waxed or unwaxed. 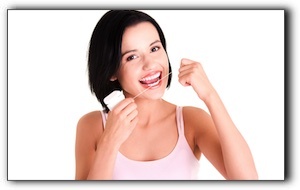 Monofilament floss will not rip or tear, and because of this, it is thought to more easily pull in between teeth. This type of floss is sometimes referred to as “glide” floss. Both monofilament floss and multifilament floss are sold in differing thicknesses, and this is where most dental patients would benefit from finding the size that fits. Since you should not have to snap the floss between your teeth, find the thickness that allows you to gently floss. Dental tape is nylon floss in the shape of a wide, flat ribbon. Many Wasilla, Palmer, and Southern Alaska residents find that dental tape is the easiest floss to get between their teeth. For those of you with braces or appliances put in by your Eagle River area orthodontist, there are also flosses designed to be used with these devices. Make sure to discuss flossing with your orthodontist because you don’t want to break this valuable habit just because you’re having your teeth straightened! A good person to ask about floss advice is your dental hygienist. Here at Excellence In Dentistry, our hygienists are prepared to answer any questions you have about flossing, brushing habits, and even cosmetic dentistry procedures such as teeth whitening and veneers. Call us today at (907) 349-0022 for your appointment! You can also visit us on the web at /about/. Contact Us Today for a Consultation or With Questions. Like Us? Leave a Review! Anchorage dentists Dr. Kendall Skinner and Dr. Kirk Johnson of Excellence in Dentistry provide exceptional cosmetic dentistry, dental implants, sedation dentistry, general dentistry and more for patients in Alaska and particularly in the Anchorage area.